Wednesday. It is such an ordinary day isn't it? It lacks the lure of Friday (Nobody eve says, "Thank God It's Wedesday"). It does not have the religiosity or relaxation of Sunday. Wednesday sits there, not quite-the-middle of the week. A bit like a boring aunt whom you visit on your trips home, more from a sense of obligation than choice. Visit the Mehta household on a Saturday or a Monday. There’s an odd feeling that perhaps they run a catering business for weddings or rent their house out for parties. 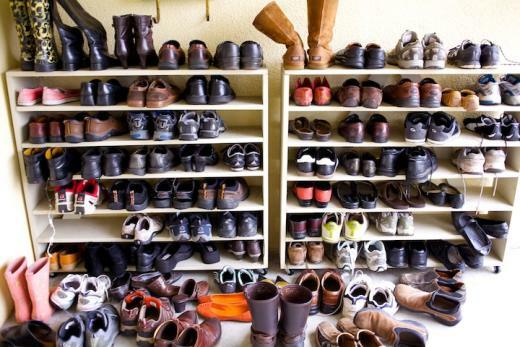 The entire breadth of the front porch is taken up by shoe-racks. The kitchen cupboards hold plates that stack three shelves high. A drawer near the sink contains nothing but steel glasses for water. Furniture in the living room is movable and hidden closets hold dozens of cushions. All very odd for a house where only two people in their sixties, live. But come on a Wednesday. Yes, that boring middle-of-the-week day. The suburban town’s street is lined with cars. The porch has shoes, slippers and clogs neatly lining the racks. The front door is slightly ajar. Push it open; walk in. A large sign with an arrow points you to the inner living room. Every Wednesday at 7pm, a group gathers. It has an hour of collective silence. Someone opens the session by reading out a passage from the week’s Awakin Reading. A mic goes around the circle and people share their reactions to the reading. At 9pm Mrs. Mehta offers a meal. It is one that she has planned, shopped for and cooked. She stands at the kitchen counter, next to her able assistants who load up plates with admirable efficiency. She offers a plate to the 60 or more people who attend. It is not a simple exchange. If you are a young college student, an extra chappati will magically appear on your plate. If you are vegan, you’ll be warned that the dessert might have dairy. Much love and service from the Mehtas goes into that Wednesday meal. Dinner is eaten in silence. An hour of sitting in silence. An hour of sharing insights to a thoughtful passage. An hour of eating in silence. The unusualness of it is extraordinary. Occasionally a person is invited to share his or her life with the Wednesday circle. Past speakers have included Bhikku Bodhi (one of the most renowned scholars of Theravada Buddhism), Shri Lavanam (the last active disciple of Gandhi), World Woman of Peace, Deepak Chopra, and incredible pilgrims like Satish Kumar and the Reverend Heng Sure. Giving people the chance to be silent. Giving people the time to reflect on the passage, and from there, to reflect on their own lives. Giving people the warmth of family, especially for those whose security blankets either do not exist or are hundreds of miles away. This and much else occur at this Awakin Circle on Wednesdays. Friendship, caring, love, generosity, warmth – there is all that more. But underscoring Wednesdays is one strong principle: focus on internal change, for only when you change within, can you have the whisper of a hope of changing the world. Awakin circles started in the mid 90s when couple friends got together to sit in silence in an ordinary living room. For over a decade, it was known simply as 'Wednesdays'. Today, it has touched numerous lives around the globe and are now being voluntarily hosted by everyday heroes in over hundred cities. Every week, we send out a digest with a wisdom reading and inspiring stories to our global community of 91,920 people. To join, enter your email below.